Address: Nessebar, 7 Ivan Vazov Str. 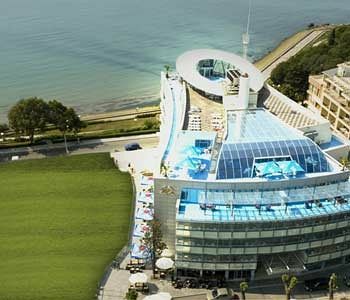 Location: Hotel Sol Marina Palace is located in the new part of Nessebar, 150 meters from the beach, among the greenery. Exceptional location - a modern hotel complex on the border of the new and the old part of Nessebar. Modernist architecture is fully formed in the glass and green colors. Rooms: The hotel offers accommodation in 123 double rooms, 1 single rooms and 4 suites. Most rooms have sea views and unique space and comfort combined with modern furnishings. - ability to use the service "video on demand"
Bars & Restaurants: The restaurant in Hotel Sol Marina Palace offers a varied menu of traditional and exotic dishes. There are main hall of the restaurant with 100 seats, small hall with 24 seats and summer terrace with sea views. The atmosphere is suitable for business lunches, meetings and cocktails. Opposite the reception desk is situated Pub bar. Informal setting for business meetings or to meet friends, offers daily bar Sol Marina Palace. With wonderful views of the Old Nessebar, Sunny Beach and Elenite, the Sky Bar is an ideal place for romantic meetings. In the lobby of the Salt Palace Marina guests can enjoy the beautiful foliage and Wi-Fi Internet connection. Sol Marina Palace offers perfect conditions for conducting business meetings, conferences, presentations, seminars and more. Depending on the event takes place, the arrangement of seats in the hall "Fregat" can be at the request of the organizer. For coffee breaks and discussions hotel has a spacious lobby with magnificent sea views. The two rooms of the main restaurant are suitable for business lunches, meetings, receptions and cocktails. SPA Center: The Spa center at Hotel Sol Marina Palace is a new modern concept of health and beauty. It is not only a center for health and relaxation, a place that embodies the philosophy of human experience in the search for life balance. The lovely weather in Nessebar /the beneficial influence of the sea during the four seasons/ are great prerequisite for recreation. In Spa Hotel Sol Marina Palace combine ancient knowledge and best tradition of European recovery with the latest achievements of science and high technology. You apply modern equipment and active natural products, and strive to ensure customers quickly occurring and lasting results. From the first contact with the atmosphere of this unique place for rest and recreation will make sure that you have found your dream "getaway". At the center of the top floor of the hotel is an outdoor pool with exclusive and unique sea vision, cozy rooms for massage, cosmetic and restorative procedures. Furthermore, the function sauna, steam bath, Jacuzzi, solarium. Relax, follow your body with energy, give the force of his feelings and inspiration of your spirit! Spa Hotel Sol Marina Palace is a wonderful opportunity for relaxation, rehabilitation, prevention, treatment, beautification and obtaining excellent spirits. On the beach: Use of sun beds and umbrellas on the beach is paid.